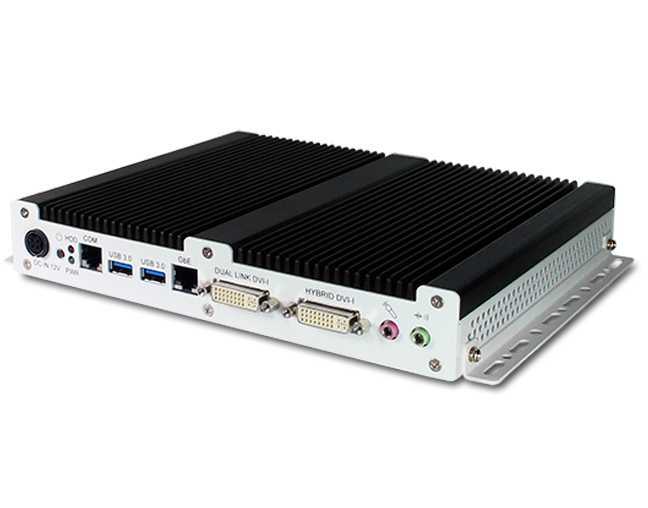 SI-38N is a dual-display fanless digital signage player. The slim-design player comes with a chassis that provides passive cooling for better system reliability and quiet operation. With an AMD A70M chipset-based motherboard inside, SI-38N supports AMD R-Series APUs, delivering high processing performance coupled with discrete-class AMD Radeon™ graphics performance. With impressive power efficiency, the APU has a Thermal Design Power (TDP) ranging up to 19 Watts. The SI-38N features dual display, with a Hybrid DVI (VGA/DVI/HDMI with audio) and a dual-link DVI-I connectors, that can display independent full HD content. Also located on the same side are DC-in socket, LED for power and HDD, power button, two RJ45 for Gigabit LAN and RS232, two USB 3.0 ports and audio jacks for line-in and line-out. Two DDR3 slots accept up to 8GB memory. For ease of installation, the player comes with wall mounting holes and optional mounting brackets. Users can avail of WiFi, Bluetooth 3G or TV tuner options via the mPCIe(x1) expansion socket. The SI-38N is fully compatible with world-class signage software providers such as SCALA, Omnivex, YCD, Dise, Signagelive and X2O Media. Currently, the model comes with either AMD R452L Quad-Core or AMD R260H Dual-Core processor.